Discussion in 'The Lounge' started by kitbb, Jan 22, 2014. Sorry it was late when I wrote that and information was still coming in. I'm super bummed. We had issues but I thought it was kinda improving just slowly. No worries. My angst wasn't sincere--or at the last, wasn't directed at you. I was just shocked, even though it made a whole lotta sense in hindsight. It made even more sense when my wife pulled a 10-shot today (because, hey, why not?) and got eight 4* monsters and two almost useless 5* monsters. With almost every 4* monster in the game completely useless and 5* rates so low, why on earth would anyone spend real money on this game? Guess it turns out that most players weren't. Same on both counts. I actually started paying attention to the game again after the 8.0 update. I guess it was too little too late. And I was just reminiscing about how much fun the previous Halloween event was, the goals and all of it. I really did think it was on the mend. I'd love to get to get my hands on an autopsy report. I really really would. I know it's a snowball's chance in a very hot place, but hey, the game's going down in flames in 3 months, so why not ask? This does seem like a valid idea. It's not like they specifically catered to the region they were marketing to, gameplay wise anyway (relatively speaking, of course). I am deeply saddened by this more than I thought I'd be. It was a game that I could play with my friend and we got to share our day. It was fun to discuss strategies and theories. And it was a game we could play separately and together. Thank you for the advice you and others have given me about this game, too! I uninstalled more than a month ago, after 2 ten-shots that only gave me four stars. It was grinding for orbs and then get completely useless monsters. Still it is shocking they close down and I feel bad for the community I met online while playing. Tbh the game started walking towards its downhill at full speed when they first locked line multiplayer, after that the game never really recovered..it was a matter of time of how long you can keep a deadman breathing. I'm amazed by you guys who still played this game, seriously. I was one of the lucky ones: a friend wanted to have a video game to play with me and he wasn't very good at games. Monster Strike was literally perfect for us. We could play on our own, co-op since we live less than a mile from each other and even after global coop was removed, we could still play as normal. Honestly, I'm applying too much of emotions into it because it had numerous issues and flaws but all that mattered to me was spending time with my loved one. It turned into our version of Dungeons & Dragons that would discuss and share time with. Deft and Tek7 like this. I agree that MS global more or less bled out following the removal of online co-op, but most of my experience with MS on LINE was frustrating Impossible runs that ended in failure and frustration. For me, Monster Strike was at its best playing local co-op with my wife. We could work on building up our monsters separately, then play a quest together with those same monsters we'd been working on. MS was so easy to play together and so simple that our older daughter played with us a few times as well. I agree that the game itself wasn't outstanding, but it made for a great social experience and I will most certainly miss that. My wife and I both work full-time and also work hard to take care of our kids and our house. That doesn't leave much time to play games, so we don't play games like Guild Wars 2 or Dungeon Siege 3 like we used to. God willing, we'll play those types of games again someday, when our children are older and a little less demanding. But for now, there will definitely a Monster Strike-shaped void in our gaming life. And hey, if anyone has a suggestion for a short-session local co-op mobile game with a low learning curve, please let me know! Deft and Otter like this.
. God willing, we'll play those types of games again someday, when our children are older and a little less demanding. Don't worry. Those were free orbs I flushed on that 10-shot. Pulled 3 10-shots across 3 accounts (global main, global alt, JP) in less than 24 hours. All 3 hatchers were Guardians series. 2/30 (6.6%) 5* pulls on my main. Both dupes. Yeah I pulled in guardians (free orbs as well) and got similar results. The orb valuation was just not there. Risk a waste for nothing. yep, seems about right, I called it quits after I pulled all 4* in two consecutive 10-shots.... I was aiming for Dead Rabbits and got nothing out of it. I did one last 10 pull before servers flatline. And, per usual, nothing but crap. Vincent Flyer PPL and Deft like this. 99 luck to max luck 6* Olive. 20000 medals required for 1 Olive. 1.98 million medals total required to max luck Olive. 3.96 million medals total required to badge Olive. 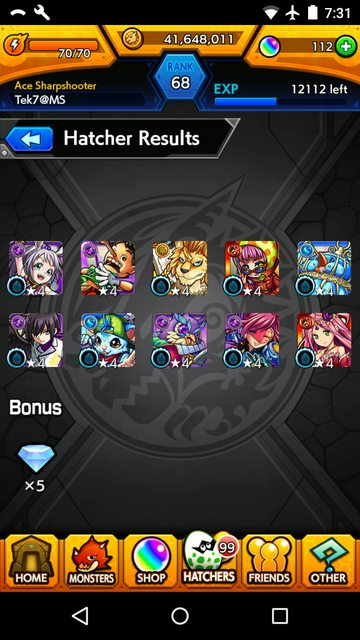 The hatcher results can get even the average player, a lot of times, disappointment. I'm really thrown out that getting a 5* useful monster is stupidly low especially during Guardians series. No hypes basically. Just pure disappointment and getting beat up from hard hitting enemies. I didn't pass through Tower Floor 23 because of not being able to strike them back quick enough. Even though I had a guide with me, I was getting wrecked left and right from those mech birds. If I think this through already. I'd have to say harsh difficulty spikes and terrible drop rates are going to be the most likely causes to not start Monster Strike. Max lucked a few more monsters so far. Lilith the Scamp, Louis, just to name a few. Since tower is here until the servers die, you might or might not have enough time to get the Legend of the Tower title before it's gone. 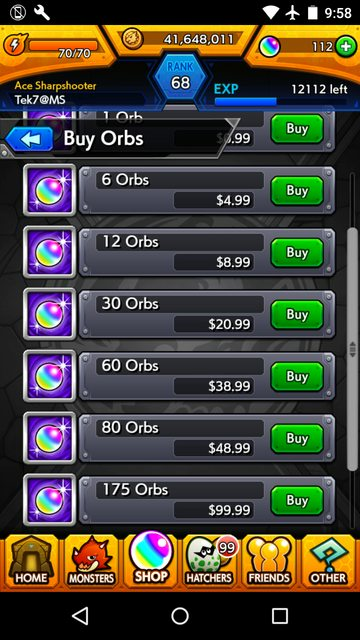 No more data migration, no more purchasing orbs, starting on July. I'm considering to start JP Monster Strike at some point in time. Otherwise I'll be back doing PAD stuff again. Also working on getting 50 total impossible/Collosal difficulty clears and Avalon out before I quit entirely. The mourning continues. Rank 200 before servers die. I got no goals left for this game and I'm not going to consider starting JP Monster Strike yet. 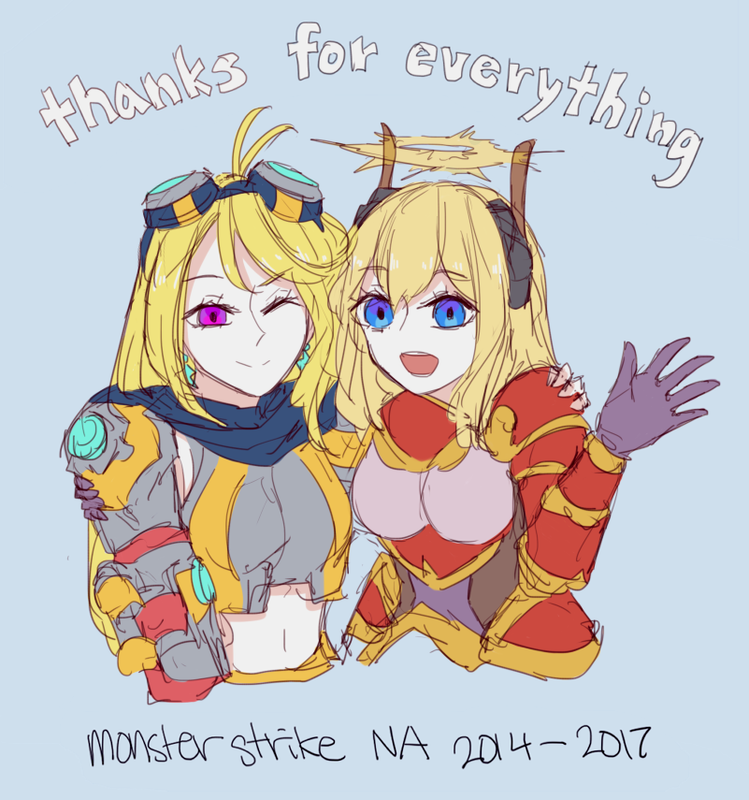 RIP NA Monster Strike Indeed. At least we have this we can commerate with. And I decided that I start JP Monster Strike because I was bored not playing Monster Strike for a few months. I haven't logged in in weeks. Just not worth the hassle for me when I can barely find time for PAD right now. Maybe I'll come back to it someday, but multiple consecutive 10-shots with ALL 4* monsters extinguished what excitement I had for MS.
Deft and Vincent Flyer PPL like this.